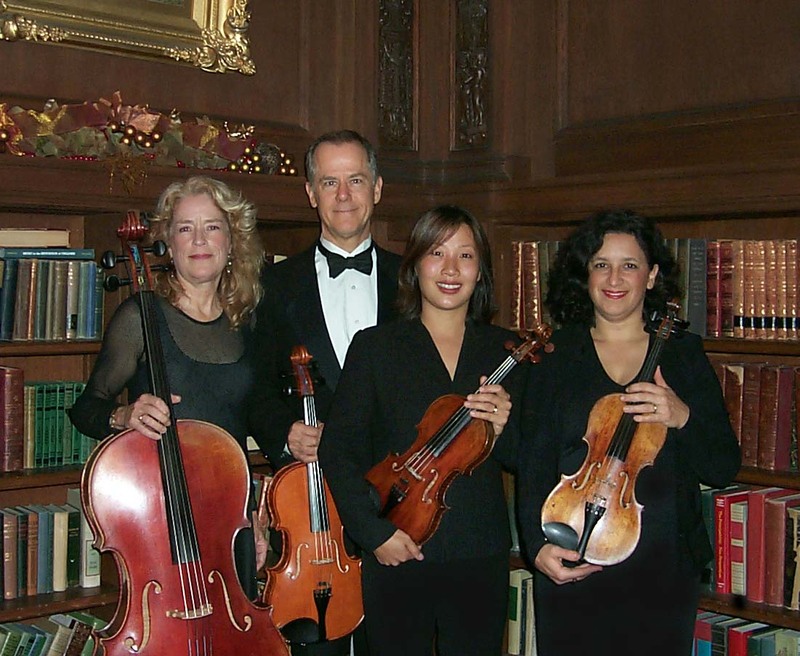 The Nob Hill String Ensembles offer an extensive repertoire of elegant classical, light-classical and popular music for weddings, receptions, corporate functions and special events throughout the Greater San Francisco Bay area. Led by Teressa "Terry" Adams (cellist and music coordinator) ensemble members include some of the finest, most experienced professional musicians in the Bay Area. Individually, they have performed with the San Francisco, Oakland and San Jose symphonies, and participated in hundreds of recording sessions and musical theater productions such as "Les Miserables," "Showboat," "Evita," "Miss Saigon" and "Phantom of the Opera." Ensemble players have performed and recorded with numerous celebrities, including Frank Sinatra, Ray Charles, Pearl Bailey, Tony Bennett, Sarah Brightman, Henry Mancini, EllaFitzgerald, Joel Grey, Smokey Robinson, Linda Ronstadt, Country Joe MacDonald,Al Jarreau, Boz Scaggs, Billy Joel, Kitaro, Aaron Neville, John Williams,Van Morrison, Bjork and many other popular recording artists. Movie soundtrack credits for the members include "Star Wars," "Predator II," "Mimic," "The Game," "OneFine Day," "Sphere," "Inspector Gadget," "Bicentennial Man" and "Once UponA Time in Mexico" -- all recorded at Skywalker Ranch in Marin County. Ensemble players have performed at many of the Bay Area's finest venues -- country clubs and mansions, hotels, restaurants, museums and exhibit halls, wineries and other up-scale locales. Additional instruments-- such as trumpet, piano or bass -- may be added or substituted upon request. Oneor more vocalists may also be added to extend the range of your event's music program. Unique as an ensemble is the Nob Hill Salon Orchestra. Built around violin, cello and piano --with more strings, bass and/or flute optional -- the Salon Orchestra specializes in "the best danceable American and Continental music from the 1890's to the 1940's." To see and hear the Nob Hill String Quartet in action, click on the link below and watch "A Perfect Day." The video was created by Savadelis Videography and filmed at the Julia Morgan Ballroom in San Francisco, in collaboration with several other event professionals whose credits appear at the end. The Nob Hill String Quartetperforms "O Mio Babbino Caro" and "Siboney" throughout and appears on-screen midway in the video, which runs approximately seven and a-half minutes. However you decide to contact us, Terry and the Nob Hill String Ensembleslook forward to providing elegant string music for your special event. Copyright © 2006 by Nob HillString Ensembles. All rights reserved.